There was a distinct culture among the kids who lived in the Lower Campus neighborhood when we were going to school there, and we enjoyed it very much. 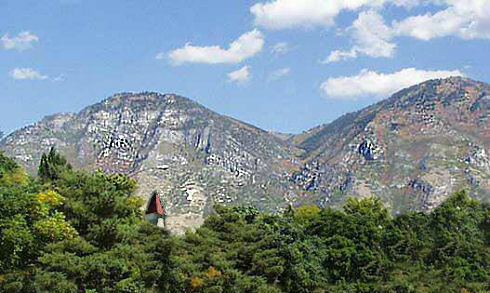 Our family lived in Provo near the Lower Campus for a decade, from 1946 through 1957. My brother and I attended the BYU Training School beginning in kindergarten, and we continued there through graduation from BYH. Our house at 455 North 1st East was just a block away from campus. The house had been built around the turn of the century with the high ceilings and large windows that were characteristic of Provo homes of that era. After we moved to another home several miles to the north of the campus, the old house was rented to college students for about ten years, then torn down as part of the development of a new apartment house complex. But our neighborhood back then had some great small-town features. For example, just across University Avenue, right next to the Women's Gym, was a popular malt shop with jukebox music, owned by "old man Calder". The term "old man" was not meant to be disrepectful of Dave Calder -- who was really a nice guy -- but my friends and I called anyone as old as our fathers "old man," and at least back then it was not a derogatory term. Calder's was a student hangout in the fifties, and probably during the forties, too. Over the years, many B.Y. High kids got their first jobs there. The Calder family lived nearby in a home on University Avenue, and Suzy Calder and her two sisters, Coleen and Sally, all attended B.Y. High. Kitty-corner from the old Women's Gym, back on the campus side of University Avenue, there were several other business establishments that were useful and interesting to the neighborhood kids. At Booth's Grocery Store, for example, you could buy used tennis balls for 10 cents each. Since my brother and I played a lot of tennis, Booth's was important to us. 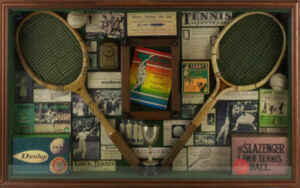 The owner of Booth's was Wilson "Wilce" Booth, who was a very good tennis player, who had been a member of the BYU tennis team in earlier years. Used tennis balls, rackets, and other stuff. Eventually John and I played on BYH varsity tennis teams. In fact, I would say that the two best tennis players to come out of B.Y. High during the fifties and sixties were Gary Rose and my brother, John Boshard. We played on new BYU courts near the Smith Fieldhouse and Heaps A' Pizza. Then there was Edna Mae's, a small diner that my brother and I frequented. Edna Mae made particularly good limeades and cherry cokes. And we can't forget Joe's, the shoe repair shop. We were hard on shoes, and now and then needed timely help from Joe. James Dean was an intriguing young movie star of that era, and his mysterious charisma seemed to increase after he died in a car accident in September of 1955. As part of my efforts to project a James Dean persona, I purchased a pair of black and white Wing-Tip shoes that I would not be caught dead in today. Joe repaired them for me several times. In 1955, the movie Blackboard Jungle was also popular. My friends and I acquired black and pink gabardine jackets that became the rage -- we were about 12 or 13 at the time. And at about the same time, the girls at B.Y. High were wearing "poodle skirts" with white shoes that required frequent coats of white polish. On the Lower Campus, there was always something for kids to do. In particular, the old Men's Gym had a mesmerizing hold on us. When we had time on our hands we could usually be found playing basketball in the Men's Gym, sometimes under surreptitious circumstances. 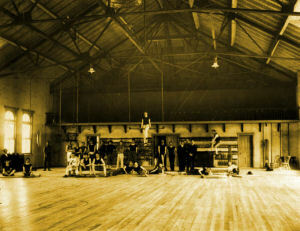 We also attended many dances in the Men's Gym. This gym was truly an all-purpose recreational facility, and sadly, those of us who wanted to play basketball frequently had to get in line behind students who wanted to schedule it for other kinds of activities. Hiking was another favorite activity for some of the kids in our neighborhood. 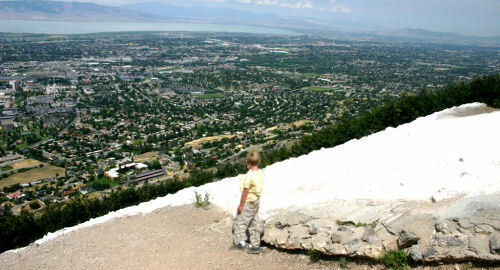 Doug Wilkinson and I often hiked the hidden wooded trails on Temple Hill between his home (the BYU president's home) and the Smith Fieldhouse. Later I sometimes returned to those trails when I needed time to be alone with my thoughts. Hiking up to the Y on Y Mountain was an all-day activity. Food was particularly important to all of us kids. There were several grocery stores along University Avenue, all located within four blocks of the Lower Campus. In addition to Booth's (think "used tennis balls"), Meservy's Grocery Store was located a block south of the Lower Campus, on the east side of University Avenue. This was where my family bought most of our groceries when I was growing up. Meservy's was owned by Oliver Meservy, and two of his daughters, Virginia and Carol, attended B.Y. High. Sowards, another neighborhood grocery store, was south and east of the Lower Campus. A few blocks west of the Lower Campus on University Avenue was Ferguson's, another small neighborhood grocery store. Dixie Ferguson was a student at B.Y. High. To the boys in our neighborhood, Dixie was the coolest and cutest older girl around. Dixie was actually only a year older than I was. I could easily invent all kinds of excuses to visit Ferguson's -- at least three or four times on any given day -- just for a chance to see Dixie. Some of the other girls who were important to me during my Lower Campus days were Diane Christiansen, Sandra Jacobsen, Karen Grow, Marie Keeler, and Mary Halliday. Diane and I rode our bikes around together on the Lower Campus, played hide and seek between the buildings, and watched the "Lone Ranger" on television. Sandra and I walked to school together and became friends as we grew into our teens. Karen, who moved to a big home in the Provo foothills when we were small children, was my first date at the Saturday movies. 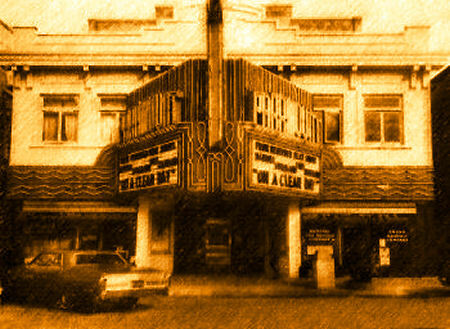 I believe the first Saturday movie I went to with Karen was Across the Wide Missouri with Clark Gable, in the old Paramount Theatre. That would have been around 1952. The Paramount Theatre was on Center Street. Diane, Karen, Marie and I went to grade school together, and Sandra and I made it all the way from kindergarten through 12th grade together. Marie, who was a gifted student, left high school early to begin her college studies. I do not know what Marie's field of study was but as I recall she married an artist that she met in college. Mary had to leave B.Y. High in her senior year, because of some kind of sabbatical her father was given at that time. He was a music teacher at BYU, and I believe they temporarily moved to California. 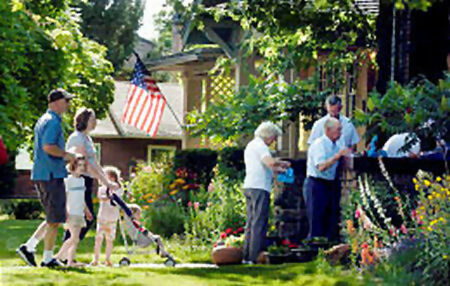 She was a student in good standing and her family returned to Provo in the early sixties. Mary went to college at BYU where she met her husband Garth. The Auditorium in College Hall was very important to a lot of B.Y. High students because of the plays and performances they practiced and presented there. Student assemblies gave many students a chance stand in the spotlight and perhaps get a laugh or two. 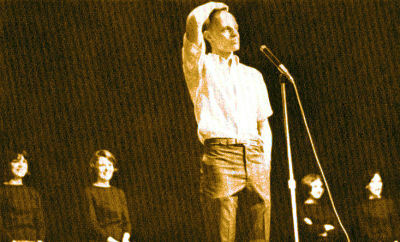 My brother, for instance, is famous for bringing down the house on stage in an assembly. When his part came up, he paused and then said, "Folks, I forgot my lines!" John delivers another of his famous lines. As for me and my close friends, College Hall was important, but for a different reason. Almost every time there was a special daytime function in the auditorium, my friends and I seized the opportunity to sneak off campus and cruise around in our cars, or play pool at Regal Lanes bowling alley. We felt at home at Regal Lanes because, for a time, Dee Kerby, Scott Anderson and I worked there for Mr. Lynne Wright as "pin setters" in the days before automatic pin setters were installed. We got paid ten cents a line for setting pins. We received no pay, however, for injuries sustained when some bowlers used us for target practice, when we did not get the pins set up fast enough for their liking. I don't have much else to say about the times I played hooky from school -- at least not that I am willing to commit to writing. Some of my cruising buddies were Scott Anderson, Nick Faulkner, John Webb, Charlie Floyd, and Dennie Wood. 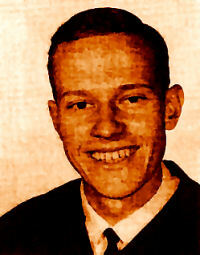 In 1957, just before I entered the 9th grade, we sort of became neighborhood outsiders, like many other B.Y. High students who lived away from the campus. Our family moved several miles north to Edgemont. We continued to attend the school until we graduated, but we felt somewhat cut off from our University Avenue friends, and we lost our easy walking access to the Lower Campus. However, we have always prized having lived there, and recall with great fondness having once been part of the old Lower Campus neighborhood.